Not to creep you out, but there are vampires in your house. These are the cell phone chargers, cable boxes and other electronic devices that use energy in standby mode. While there’s some debate about the impact of vampire power on your energy bill — some say it accounts for up to 10 percent while others say it’s less than 1 percent — it’s still a good idea to drive a stake into the heart of energy waste anywhere you can. Unplug devices you don’t use often such as extra TVs or old desktop computers. Use power strips, which allow you to toggle the power on and off. You can control the power use of a cluster of devices so they’re not consuming electricity when you don’t need them. Cut down the idle time on computers and video consoles. When buying new electronics, choose ENERGY STAR products which have been tested and rated for energy efficiency. Household gadgets, by the way, are using less power. But there are so darn many electronic devices in use now that keeping an eye on their energy consumption is becoming more important. If you’re feeling a little drained by an old inefficient water heater, check out the new technology of a heat pump water heater. By upgrading to a super-efficient heat pump water heater, you can reduce your electric water heating costs by up to 50 percent and save every month. Upgrade by December 3, 2014, for $400 instant savings on a GE GeoSpring 50-gallon heat pump water heater, then save again with a Chelan PUD $300 rebate. The $400 markdown at the store combined with the PUD’s $300 rebate drops the price by $700, making the final cost around $500. Participating stores are Lowes, Sears, Ferguson and some independent retailers. Handy homeowners can install these units themselves; use this tip sheet for help with installation. Or you can find a contractor here. Space – Most units require at least 800 cubic feet of air-flow around them; this is the equivalent of 10′x10′x8′ of space. Sound – Heat pump water heaters generate sounds similar to a freezer. Cold air – While in operation, heat pump water heaters release cool, dry air. Size/height – Heat pump water heaters are slightly taller than standard electric water heaters. Get help evaluating whether a heat pump water heater is right for you at smartwaterheat.org. Find GeoSpring product details on the GE website. Have you hugged your heat pump today? If they didn’t sit so high up on the wall you might try to hug them. People just love-love-love their ductless heat pumps. These little workhorses — popular in Japan and Europe for years — are gaining ground in the Northwest, offering quiet, efficient cooling and heating. What’s not to love? Glen Ferrier says his family’s comfort “has gone way up” since installing an energy-efficient ductless heat pump in their Leavenworth home. 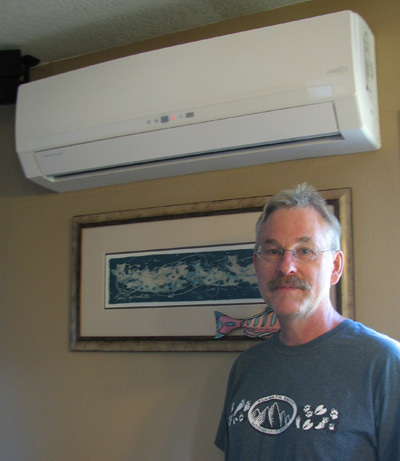 Since Chelan County PUD began its ductless heat pump program in 2012, about 35 customers have installed units in their homes and taken advantage of rebates of $750 per household. Among them are Glen and Jacqueline Ferrier of Leavenworth, who wanted to supplement the baseboard heat in their 35-year-old home and add air conditioning. The Ferriers had no air conditioning before installing their ductless heat pump. Their electric bills are slightly higher in the summer now, Glen said, “but who’s to complain? Our electricity here is ridiculously cheap.” Winter bills have gone down. And because the Ferriers don’t need to use their wood stove as a backup nearly as often now, they’re saving money on firewood, Glen said. The home is 1,600 square feet on two levels. The ductless heat pump provides heating and cooling for the kitchen, living room and down a hallway to three bedrooms. Fans installed prior to the heat pump help circulate the heated and cooled air. PUD rebates are open to customers with electric furnaces, baseboard, wall or radiant heat living in site-built, single-family homes up to a four-plex. Manufactured homes with furnaces are eligible, but manufactured homes using baseboard or wall heat are excluded. Customers are eligible for one rebate per household. Details are on the PUD website or by visiting goingductless.com. A study in 2015 will help determine whether smart-grid technology would benefit Chelan County PUD business customers by providing tools to manage and monitor power use and conserve. The analysis will focus on the PUD’s “Top 500” industrial and commercial customers, many of whom have asked for these advanced services. John Stoll, Customer Utilities managing director, said the PUD has built a solid foundation of software, systems and automated equipment over two decades to support a smart grid and the benefits that the technology can offer. The plan is to use technology such as the District’s fiber network as a base for adding other systems to provide more information for decisions about reliability, power quality and customer services. The analysis planned for 2015 would include a look at updates for the District’s customer billing software and at how best to manage the increased data generated by advanced meters. A consultant will be hired this fall to help determine requirements. If the analysis shows customers would benefit, two-way meters would be installed in 2016 for the PUD’s “Top 500” business customers, which represent about 40 percent of the electric load. About one third of the PUD’s residential customers have automated meters, including 2,000 just installed in Cashmere during upgrades made after the District purchased the city electric system. PUD water customers have had automated meters since 2006. Hats off to Chelan County PUD customers, who helped the PUD reach half of a two-year conservation goal in just six months. Andrew Grassell, Energy Development and Conservation manager, said there has been great response by customers to the rebates offered by Chelan PUD on energy efficient appliances, heat pumps, windows, insulation and LED lighting. Kent and Annie Chalmers of Cashmere are enjoying the benefits of adding insulation through Chelan PUD’s rebate program. Under the state’s Energy Independence Act, the two-year target for the PUD is 2.08 average megawatts (aMW). By the end of June, the PUD had achieved 1.18 aMW – well above the 1.08 aMW target for all of 2014. The savings so far this year are enough to power about 400 Chelan County homes. The Conservation group takes the energy-saving targets as a minimum, Grassell said, and will continue to offer programs that appeal to customers. Rebates on refrigerators, clothes washers and LED retrofit kits, along with window and insulation incentives, are the most popular. Industrial customers also are actively participating, installing lighting, cold storage and other energy-saving upgrades with help from the PUD. Grassell noted that savings extend beyond program participants. All customers benefit because energy that is saved is sold on the wholesale market, helping to support low, stable electric rates. The local economy is supported, too, through the purchase of products and services in our communities.